We are experienced in getting big, bulky couches out of the house in a jiffy. 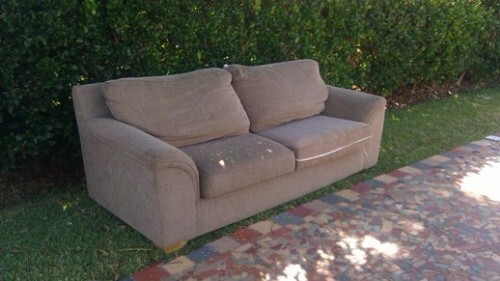 Over the past ten years we have helped folks get rid of over 2,000 couches in San Diego. We once picked up 13 couches in a single load from a fraternity house at SDSU – We should have called Guinness, that might be one for the record books. It doesn’t matter if it’s a love seat, sectional sofa or a hide-a-bed – Fred’s Junk Removal is the couch removal expert to call when you need to make your old furniture go away. Our couch removal fees are one of the best kept secrets in San Diego – Give us a call and don’t over-pay for couch removal.